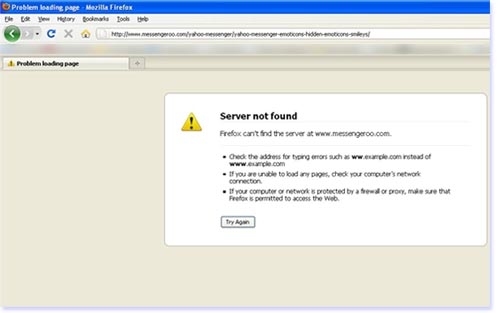 When I was surfing all around the net today through Mozilla Firefox, i really struck down with a particular URl related with the same domain name and its further links instead showing me the page it just showed “Server Not Found” page. while I was keep on following further links of "Yahoo messenger" routed inside for few details but I was suddenly struck down at point “Server Not Found” not able to access more than that. I stopped there and tested other sites..! It was displaying..,! So what happened then for particular links..? • Web browser, perhaps out-of-date browser which has no provision to deal with new technologies incorporated by a particular website. Update and precede a full scan to detect any virus with your antivirus security in your system also scan with online antivirus utility furthermost for safe. At the top of the Firefox window on the menu bar Tools > Internet Options > Browsing History > Delete and then choose to remove cookies, temporary Internet files, and history. 2. In the Time Range to clear: drop-down, select Everything. 3. Click the arrow next to Details to display the list of items that can be cleared. 4. Select both Cookies and Cache. 2. Select both Cookies and Cache. 3. Click Clear Private Data Now. Also watch the status of modem, net connection while this problems occurs to identify and rectify it. I think the above steps what I followed will help you terminate the “Server Not Found” errors (certain sites or pages) but if not that, follow me because I also finally tried by running Regedit making few changes in registry but only after when I uninstalled Mozilla Firefox later downloaded it from cnet.com and again installed Mozilla Firefox, the problem was fixed. So the conclusion is regularly update your Web browser to ensure that it has the latest updates installed.